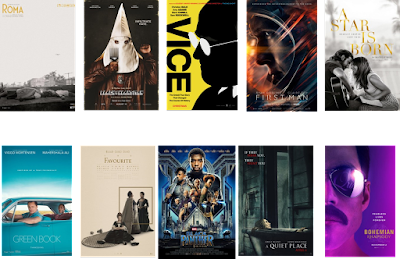 The rundown: This category has offered up some shocking snubs in recent years, including “Get Out” and “Lady Bird” last year, with two films not nominated for Best Picture included in their place. The American Cinema Editors have two separate categories, dramatic and comedy, totaling ten nominees. Roma seems like the only true sure thing here, but I imagine that BlacKkKlansman shouldn’t have any trouble getting in also. Much as I’d like to see it snubbed, I feel like Vice is going to get in here no matter what, and the same is probably true of First Man, which should do well in technical categories even if it fails to crack the top races. A Star is Born is a movie that I feel could easily be left off the list, but I’m predicting it to make the cut, eclipsing Green Book, The Favourite, and Black Panther, though it’s anyone’s guess which, if not all, of them, get in. Bohemian Rhapsody, an ACE Eddie nominee, doesn’t stand much of a chance, and I’d also count out comedy honorees Crazy Rich Asians and Deadpool 2. The only films not cited by ACE with a shot are A Quiet Place, a film that could end up with numerous bids on Oscar nominations morning or with none, and Widows, which sadly seems headed for zero total bids. One possible crazy scenario: I’d be overcome with joy if American Animals, which picked up a British Independent Film prize in this category and contends for a Film Independent Spirit Award, got recognized for its incredible assemblage of its riveting story. Forecasted winner: I see Roma winning this along with other prizes.